As the fog lingers near the St. Lewis Strait, an iceberg has found itself grounded along the coast of Great Caribou Island in Southern Labrador. It will slowly begin to disintegrate until completely disappearing after traveling many miles when it broke free from one of the Greenland Glaciers. The ice which makes up this iceberg is anywhere from 10,000 to 15,000 years old. The weather and movement of the tides will carry an iceberg aimlessly around the ocean, this one ending its adventure at Great Caribou Island. It will remain grounded here until the melting process is near completion or until the tides once again carry it out into the vast waters where it will take a month or so to totally thaw. 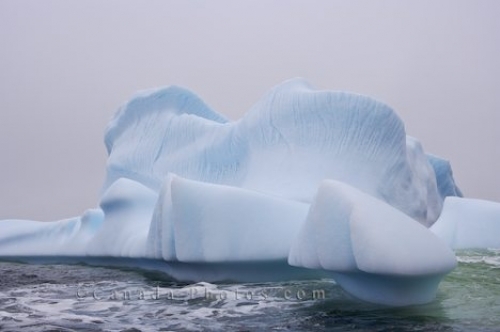 Picture of an iceberg near St. Lewis Inlet which has become grounded around Great Caribou Island in Southern Labrador. ... The ice from this iceberg is 10,000 to 15,000 years old and originates from the Greenland Glaciers which calve into the ocean and are then caught in the Labrador currents.